He has photographed the landscape of many countries throughout his working life both on assignment and for his personal projects, but returns often to a few locations that are key to his vision. Paul was born in Hong Kong. He studied art at Bournemouth Art College and then completed a 3 year Photography course at Birmingham Art College in the early 1970’s. He began freelancing in his final college year, working for publishers, record companies and design groups in London. In the early 1980’s he started working for advertising agencies and is represented by agents in London, New York and Paris. He has won numerous international awards for his advertising work and has exhibited in the United Kingdom, New York and Tokyo. He has photographed the landscape of many countries throughout his working life both on assignment and for his personal projects, but returns often to a few locations that are key to his vision. He published 4 ground-breaking books of photographs in the1980’s with the author Jan Morris for Aurum Press :- Wales the First Place, Scotland a Place of Visions and Ireland Your Only Place. 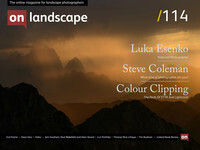 His latest book, The Landscape, published in 2014 by Envisage Books, is a large-format monograph that includes 80 of his finest images. They are organised according to bio-region, and create a specific sequence attesting to his singular eye. It includes essays by the acclaimed author on landscape, Robert Macfarlane, the Turner specialist at the Tate Gallery, Andrew Wilton, and the painter Anthony Connolly. The unnerving stillness of the photographs prompted Macfarlane to write “Turning the pages of this book, I found myself again and again reaching out to touch the images. His is haptic photography – an adjective we take from the Greek, meaning I fasten onto, I touch.” . Through the means of an illustrated interview with the photographer David Ward, Paul responds to David’s questions talking about how he has balanced his commercial work with the need to continue doing his personal work.